Laura Johnson: It's official. . . I look like our dog. Wee puppy Marley, rescued by the fabulous people at the Dogs Trust, is getting huger by the day and the jokes and the giggles over my parents now having a ginger dog to match their ginger daughter continue. 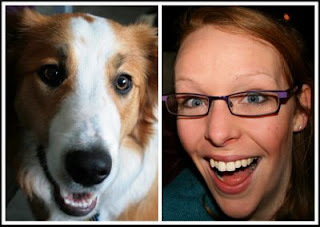 The rescued pets group over on redbubble had a photo challenge around the theme of pets who resemble their owners. Now, whilst not officially Marley's owner I thought my family would have a chuckle at my entry, seems the voters did too as it won the challenge! If you look closely you can even see Marley's 'glasses', they aren't as striking as when he was tiny but they are definitely still there. Marley is currently causing havoc at home after having his necessary boy operation he has now managed to chew through his stitches whilst still at the vets, destroy his lampshade-style collar to chew through them again at home, gone back to the vets to be stapled (sorry to any male readers wincing at this point) and is defying the laws of sedation by running around like the loon that he is! Are one or the other of you posing deliberately to show resemblance or is it coincidental?! Anyway, I laughed... but not about the stitches. Ouch. Wood Jewellery here, having followed your link from the folksy site, sorry to say after being initially amused, am now sat with laptop protecting my assets, sorry, it's a guy thing. Kitschy Coo - similarity is coincidental! Which is slightly more shaming! Neil - hope you've stopped wincing!